I probably don’t have enough hairs on my head to count the number of times I’ve told myself not to expect too much from a book. You see, I have this terrible habit of building up a book to be something truly amazing in my mind and I usually end up feeling disappointed by the end of it. Needless to say, I didn’t want to be disappointed by Something Like Normal, a novel which has been receiving raving reviews for the past few weeks, yet I think I was. My vision of what Something Like Normal would be was rather different from what it turned out to be, but at the end of the day, I still winded up enjoying this novel immensely. When Travis, a U.S. Marine, returns from Afghanistan, all he wants is some form of normalcy. Yet, when he arrives home he finds that his girlfriend and brother have hooked up while he was at war, his father is cheating on his mother, and he is suffering from post-traumatic-stress-disorder due to the death of his best friend, Charlie. Suddenly, Travis’ home feels nothing like what it used to be. Furthermore, he is suddenly confronted by Harper Gray, the beautiful girl whose life he ruined due to a little white lie back in middle school. Something Like Normal is Travis’ story – his journey if you will – to find what it means to be in love, re-discover himself, and find something like normal. I have always had a soft spot in my heart for novels narrated by a male protagonist, and Something Like Normal is no different. Travis’ voice is realistic, reminding us all that despite being a Marine, Travis is just another nineteen-year-old boy – he drinks, he swears, and he sleeps with girls. I think Doller’s portrayal of him was remarkably powerful simply because it hit so close to home. Travis’ growth was slow, deliberate, and made up primarily of his interactions with others. Although his relationship with both his father, who has always been disappointed by him, and his brother, who has gotten everything that was ever Travis’, was less-than-perfect, his developing relationship with his mother was heartbreaking. Prior to reading this book I don’t think I ever imagined how gut-wrenchingly painful it is for a mother to send her son to war, but this novel made that all very shockingly clear. Yet, the best aspect of this novel lies in Trish Doller herself. It is evident from reading this story that Doller loves Marines – to her, they are more than fighters, protectors, and saviors – they are real people. Doller captures humanity in this novel with such perfection that it is impossible not to be in awe of her. She never tries to justify Travis’ reasons for joining the Marines to be something noble, instead, she blatantly tells us that Travis joined simply to escape from his father. Furthermore, the amount of research that Doller put into this novel to make it authentic all made this story so much more tangible to the reader. It not only gave a very empathetic portrayal of PTSD, showing how Travis struggled to cope with the effects of war, but it also conveyed the truth of living in Afghanistan. In addition, Travis’ mindset of being in a war, being constantly aware of the enemy, and being constantly on the lookout for danger were all written with a talent that I find to be remarkable for a debut author. Nevertheless, I did have one major qualm with this novel: its love story. I feel as if I’ve been bashing on romances quite a lot lately, but I simply feel as if this novel would have been infinitely more powerful without Harper’s presence. First and foremost, I found it to be ever-so-slightly odd that Harper forgave Travis for ruining her entire childhood after punching him once. In fact, after that (rather brilliant) punch, there was barely any mention of that event again. Perhaps Harper is simply a much nicer person than I am, but I can’t see myself forgiving someone for inadvertently starting nasty rumors about me that destroy my childhood after one punch in the face. In addition to that, the moment their romance begins to have some tension in it and be threatened by Travis’ ex-girlfriend, Harper forgives Travis after a few hours of frosty silence. In all honesty, Harper simply seemed too good to be true. Furthermore, I never felt as if I was truly connected with Harper. As a reader, I didn’t understand her as much as I would have liked to and could not empathize with her family situation in the least. I think Harper really helped Travis to gain a sense of normalcy in his life and I think their romance was sweet, but I was never wholly invested in it. I really wish that their love story had been better developed since it was such a large aspect of this book. Either than the romantic angle of this novel, I think I pretty much loved everything else about it. I was surprised by its short length and I definitely was expecting a little more closure on Travis’ PTSD, but I think the ending stayed true to the believability of this novel. All in all, I think Doller accomplished what she set out to do. 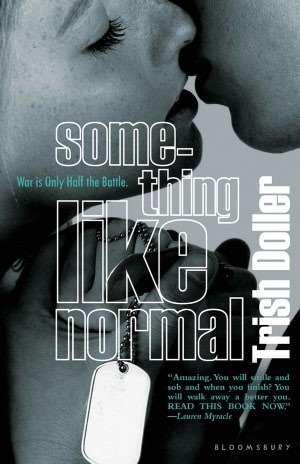 Something Like Normal is a unique look into the mind of a U.S. Marine whose life changes not only because of war, but because of his family problems as well. If Doller’s debut was this heart-breakingly good, then I cannot wait to see what she has planned in the future! This is one author I will definitely be keeping my eyes open for. Seriously, how did you get your blog looking so good? It's fabulous. I think I'll have to subscribe to your reviews now you have an email button for me! haha.